There are several things that grab your attention the first few times you attend the Traditional Latin Mass. Some immediately notice the positioning of the crucifix, candles and altar cards which are situated for the Mass to be offered ad orientem. If it is a Low Mass, the greater emphasis on silence can be quite striking. For most, however, the sheer sight of so many women veiling at the Mass presents a visual rarely seen these days in the “typical” Catholic parish. So what’s the deal with all the veils? This of course defines the practice of veiling (or to be more precise covering ones head) as one of obedience and not simply personal devotion. However, the 1983 Code of Canon Law did not reissue canon 1262. In fact, canon 6 of the revised code abrogated it, in addition to any other canon of the 1917 Code that was not specifically included in the new legislation. What then is driving the rediscovery of such a beautiful tradition among so many women, particularly younger women? More specific to this discussion: why are so many women who choose to attend the Traditional Latin Mass also deciding to veil? The answer is simple and twofold. 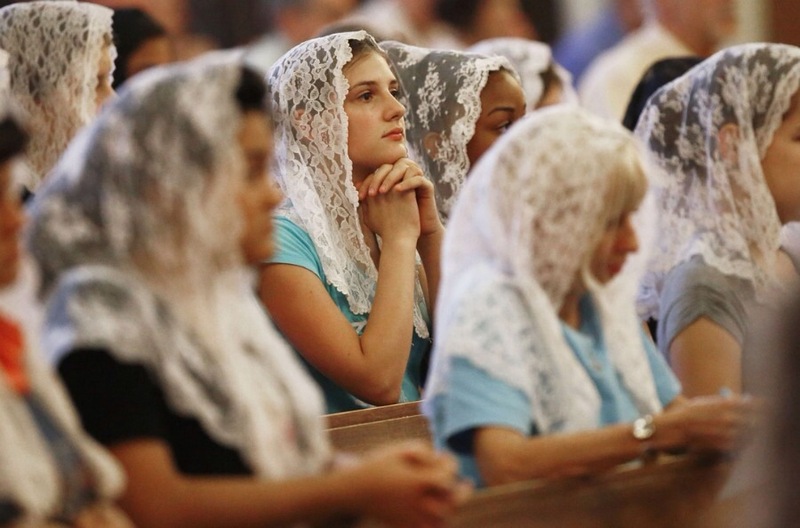 First, presented with so many others veiling at Mass, women begin to feel a pull toward the practice. I have personally heard of many such examples. At times, the primary reason women have waited so long to begin veiling is simply due to the fear of others reactions to them. It is not because they do not want to veil. Entering into an environment where most women cover their heads at Mass, these women finally make the intellectual decision to respond to the spiritual calling to cover. It is as much a response of their heart to God’s calling as it is something they themselves have chosen. If for no other reason than obedience, attendance at the Traditional Latin Mass allows for women to veil -often for the first time ever- in the presence of the tabernacle and Our Eucharistic Lord. An increasingly greater availability to the Traditional Mass (the Extraordinary Form of the Roman Rite) in the years since Summorum Pontificum is facilitating the reemergence of this beautiful practice. While there is no sin in NOT veiling at the Traditional Mass, refusing to do so is a conscious decision to oppose the expectation of the Church…at least once one is aware of the practice at the time of the 1962 Missal, the 1917 Code of Canon Law in force then and, finally, the recent statement from Cardinal Burke. Please take a moment and watch the below video by the Catholic News Service regarding the reemergence of this beautiful practice. While the video begins by incorrectly stating that veiling ended because of Vatican II, it stills presents a good overall explanation of the theology behind veiling. Of course, the arguments put forth are applicable to all forms and rites of the Catholic Mass, and are not exclusive to the Extraordinary Form alone.